We are sure that at least once in your life, most of you wanted to capture something you saw on a computer screen or on a mobile device. And someone’s main work is to permanently view changing information, which needs visual comparison and analysis, in order to check it. Of course, you can just capture a screen but it will be not very nice and a quality of a shot will be really bad. A simple way to qualitatively and, the main thing, quickly save it in a documented way is to make a screenshot of a screen and analyze captured information in future. Well-made screenshot will not only allow you to view operations, performed on a screen but also to conduct an analysis of details and parts which are present on a screen, to which we should pay our attention (in our case, for example, searching a visual bug with the shifted layout of contact form in IE11). And in order to capture a problem and qualitatively decode it, obtained by qa testing companies shots should have all possible captions, arrows, table or a marked list. 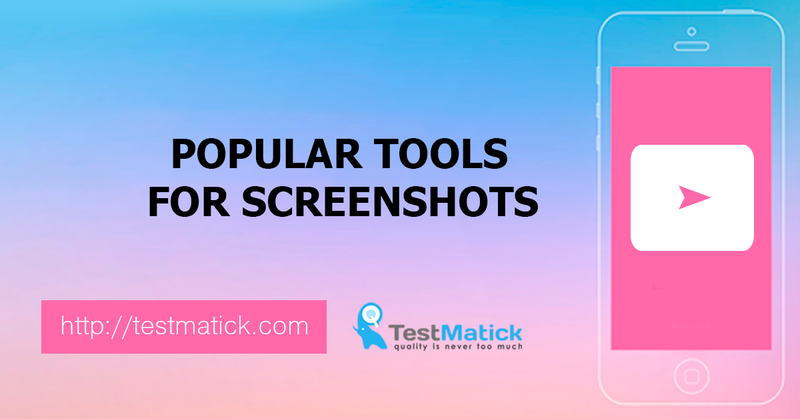 Right for searching the most qualitative and useful programs and extensions, we will overview the most popular web tools for taking screenshots. We will tell about both professional utilities and simple extensions which actually differ not much from the first extension for screenshots – PrtScn button and Paint program. An application which completely replicates a popular SnagIt program but has some significant differences (in a good sense). 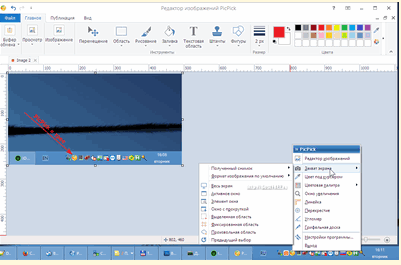 The utility has a Russian interface and also a good graphical editor, which has a huge set of useful tools and also numerous parameters of capturing work surface for taking a screenshot. It has a range of so-called “hot keys”, which make capturing easier (especially it’s true for IT-development field when you need to quickly run a ready part of a product for its visual functionality or test a product obtained from developers). PickPick will help you to capture both a whole screen and its separate parts (fragments). A disadvantage of the application is that it doesn’t support screen capturing when working with the video but technical advantages substitute this weakness. Analyzing a set of technical tools of application, we can find everything that a modern user needs: numerous styles of highlighting, a function of creating a text block, callout, pixelation, blur, effects. You can save a screenshot in any popular format both on a local PC and on a cloud storage (Google Drive, Dropbox, OneDrive, etc.). If you have configured a mail client, you can easily send a shot to mentioned mail address. If you are a real fan of Open-source software and would like to use only one program in all cases, then you should pay attention to Greenshot: it’s a free application for creating immediate shots. 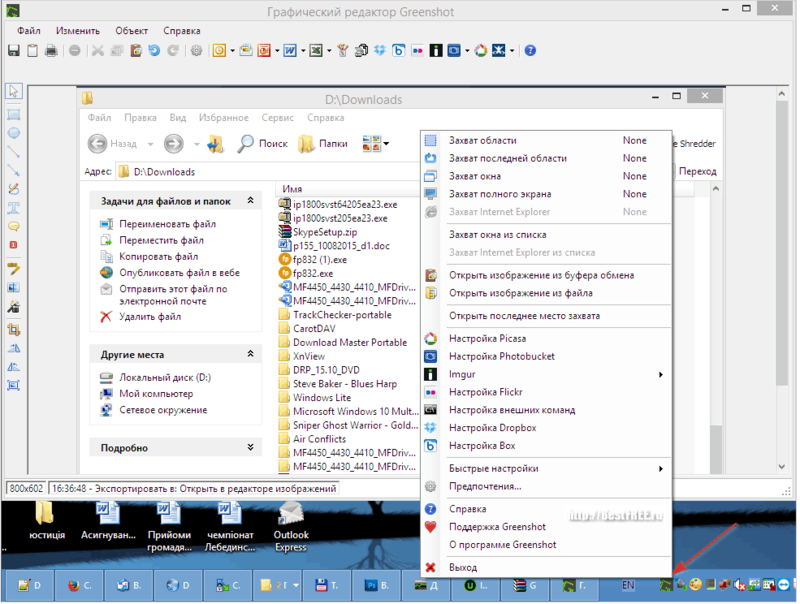 Though Greenshot application is for English users, you can find in the net many Russian versions and also a comfortable portable build which doesn’t require prior installation on PC. A possibility to connect internal modules. Generally, Greenshot is an interesting utility, which will be a perfect choice for commercial use in any situation. Interesting, absolutely free application which allows you to make qualitative screenshots and all possible manipulations with them. Available additional and useful functions: dropper, palette, ruler, image combiner. By the way, ShareX has a better technology of creating the text blocks than Greenshot has (in a special opened window, you should mention necessary text and get a possibility to copy, if necessary). If you don’t like to work with numerous unnecessary tools and extensions, then Monosnap is definitely for you. Primarily, it’s made for quick taking the screenshots and sending them over the Internet. 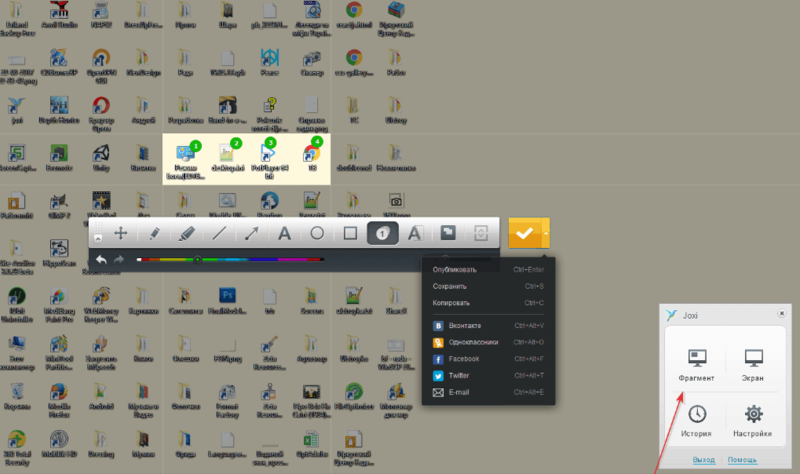 In a right bottom corner of the desktop, you will see a special panel which is a shortcut of the file reception field. It helps to send over the net not only screenshots but also other files by just dragging them over a shortcut. In order to capture a necessary area, an application offers only 2 variants: complete capturing of the whole screen or capturing of a necessary area. A huge advantage of Monosnap application is a function of recording from the screen and images from web cameras. A graphical editor of utility consists of a set of the most necessary functions and parameters: a logic of drawing the figures, creating marks, a set of effects. So, Monosnap is a useful express screenshotter which is, by the way, available on the net for free. With its help, you can quickly share chosen shots or create a screencast on screen recording. At the end of this overview, we’d like to talk about one more really useful and efficient tool for making screenshots – Joxi utility. To completely use an application, it’s better to create a free account on the official site of developers team. This step will allow you to quickly upload images (up to 1GB) and freely store them up to 90 days. If you pay a small sum of money, you will have a possibility to increase the size up to 5GB and use some useful functions, for example, direct connecting to your own Dropbox or given FTTP server. Joxi’s functionality is similar to the one of Monosnap but it can’t capture video and doesn’t allow to directly upload data to the cloud store. Joxi’s advantage over similar utilities is its own extension in Chrome browser, which helps to create fragment parts of content without direct installation of the application. Joxi has also a wide popularity for its connected service of uploading the screenshots into social networks and applications: VK, Odnoklassniki, Twitter, Facebook. As a software, Joxi can’t be analyzed as a multifunctional tool but as a useful web extension in the browser, which performs a minimum amount of work with screenshots, it’s quite good! According to analyses of mentioned utilities and extensions, there is no perfect and free editor for screenshots that software testing outsourcing companies can use. Each of them has its advantages and disadvantages. But in order to solve simple everyday tasks, you can easily use one of mentioned. We wish you good screenshots and may all your screenshots be always professional and useful!